It’s a super hero love story! Blade Man may sound a bit strange, and the first episode had me wondering if I really wanted to go through 17 more hours of what I had just seen, but I kept on going and really, really enjoyed it. Joo Hong-Bin has no idea what happens when he’s very angry while it’s raining. But Han Jung-Soo, his faithful sidekick/secretary, knows and he guards Hong-Bin with his life, literally, so no one, including Hong-Bin will find out. Sharp, metal blades sprout from Hong-Bin’s body when he’s not able to contain his anger. It’s kind of a cross between the Incredible Hulk and Wolverine with a little bit of Superman mixed in for good measure. Our hero is a rich, conceited, hot-tempered young man who is tamed through the power of the love of a kind-hearted woman, Son Se-Dong. Hong-Bin has closed himself off to love because of an impossible to please, emotionally absent father, coupled with the fact that his girlfriend disappeared. But she didn’t leave Hong-Bin truly alone. He gets to be a father to the son he never knew he had. Father and son both come to love Se-Dong, who works for Hong-Bin’s video game company. Will Hong-Bin and Se-Dong ever get together or will something/someone keep them apart? Lee Dong-Wook played the attractive, yet childlike Hong-Bin. My favorite thing about him was how cute he was every time he asked Se-Dong to hug him. I wanted to jump right through the screen and give him a big squeeze, myself. He’s also darling when he smells Se-Dong. Yes, I said smells. He closes his eyes and sticks his nose right next to her as he sniffs. To Hong-Bin, at least, she smells wonderful and her scent has a calming effect on him. It’s so cute. His arrogant side is even attractive because you can tell it comes from his own vulnerabilities. He’s the type of person who, when he falls in love, falls 100% head over heels. I wasn’t thrilled with the overly-sufficient self-sacrificing part of his character, though. People in Kdramas are way too willing to give up their love for some reason or another. Love should be self-sacrificing but some Kdramas go way overboard. You know, people, it’s okay to fight for love now and then. Son Se-Dong is a sympathetic young woman who gets by a day at a time. She and her “team” of friends developed a video game and Hong-Bin’s company hired them. Se-Dong meets an abandoned little boy at the airport who clings to her for security. He loves her and even calls her his wife. Se-Dong is always putting everyone’s needs over her own because of the guilt she feels from two incidents in the past involving her parents. Han Jung-Soo is Secretary Ko. He’s a darling character – a giant teddy bear. He has to be big to hold the humungous heart he has. He loves Hong-Bin and wouldn’t hesitate to give up his own life to save his boss/friend. I was so glad they gave him a personal life, even though it didn’t happen until close to the end of the show. Better late than never. The relationship between Hong-Bin and his son, Chang, reminded me of the father/daughter relationship between Seong Min-Woo and Ye-Eun in the Kdrama Oh! My Lady. Both pair definitely had to warm up to their surprise parent/child situation. And both kids were darling. The way Lee Dong-Wook and Jung Yoo-Geun interacted on screen made me believe they got along great behind the scenes, as well. They had a really unique concept going, with Hong-Bin sprouting blades when he gets angry, but the writer just kind of let it fizzle as the romance part of the story blossomed. It was disappointing. I kept wondering what happened to the blade man part of Blade Man. The last several episodes concentrated on his heart and not his super powers. Blade Man has a decent soundtrack that compliments the show. There’s something about the song I Love You But It’s Not Love that says, “I was composed just for a romantic Kdrama”. For some reason it just doesn’t sound like one you’d hear on the radio or at a concert. KARA sings a nice song called Hello, but my favorite song in the show is I Love You, sung by Lee Soo-Young. As for settings, there are several good ones. I loved when they filmed in Hong-Bin’s house. The architecture and interior decorating is so cool! Some of the filming is done in a little country village. The area is so pretty that on the bus ride there people giggle at how excited Se-Dong is. She just keeps saying “wow” over and over again as she sticks her head out the window. The shots on the river are lovely and I love the scene where Hong-Bin and Se-Dong are hugging on an empty road in the middle of the village and there are tons of fireflies dancing around them… now, that’s romantic! There’s also one cool looking scene where Hong-Bin climbs up the outside of a building during a rain storm. So, it’s not perfect Hollywood CGI, but it’s really awesome looking! 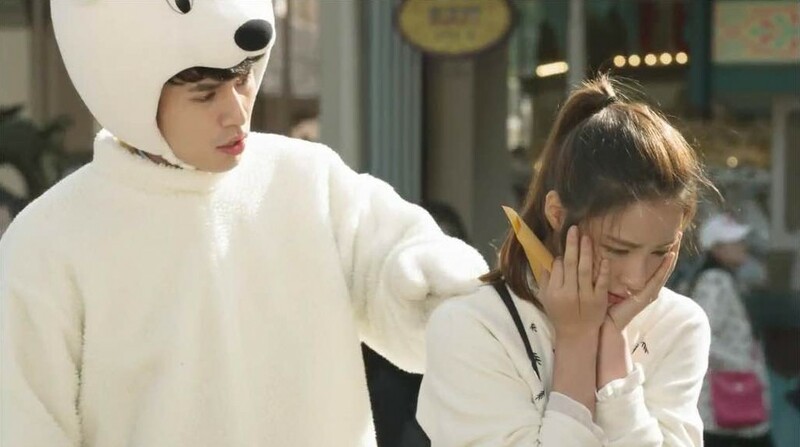 Fantasy, romance, comedy – Blade Man has it all. Don’t take it too seriously, get through the first episode, and you’ll really enjoy this super hero show. Have you been wondering how he got his blade power? Well, I’m not telling… but it’s very clever.